From soon to be featured local Las Vegas brewery, Lovelady Brewing Company, I enjoyed their HopAtomic DIPA. 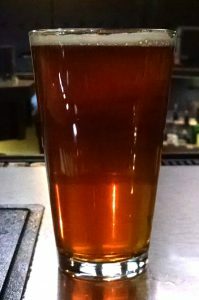 The beer had a see through golden copper color, but the pour left a small head that disappeared pretty quickly for an IPA and didn’t leave much lacing. The fruity aroma kind of threw me off as I was expecting the usual hoppy, bitter and floral scent. For a beer with an IBU rating of 85, I was expecting the typical taste most get from a hoppy beer, the bitterness. This was a surprisingly well balanced IPA that actually finished with citrus flavors. I’m not a big IPA guy but this one I will definitely get again. Let me know what IPA’s you enjoy and if your in Vegas, make sure you give this one a try.